Stephen Layton and Polyphony continue to blaze a trail as dazzling interpreters of a wide range of choral music. Here they turn to some of the most bewitching and distinctive choral works of the twentieth century. Francis Poulenc (1899-1963) imbued this well-loved music with a deep expression of his faith and unique personality. 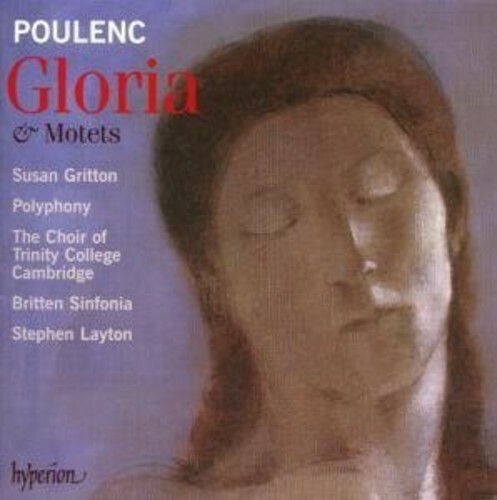 Each motet, with its own delightfully etched character, echoes the composer's study of Bach, Monteverdi, Palestrina, or Gabrieli, but remains stylistically progressive, containing Poulenc's ingenious chord progressions. The Gloria is one of his most enduringly appealing works. In some ways straightforwardly pious, it is also tinged with mischievous irreverence and a sense of rollicking enjoyment - facets which are deftly captured here by the soprano soloist Susan Gritton, Polyphony, the Choir of Trinity College, Cambridge, and the Britten Sinfonia, all led by Stephen Layton.